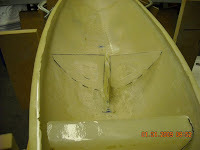 Hew advised that frames or stiffeners should be added to better strengthen the keel box. 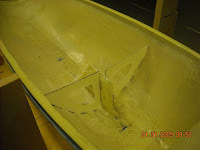 This was accomplished by cutting some epoxied fiberglass to fit the shape of the hull and the sides of the keel box. 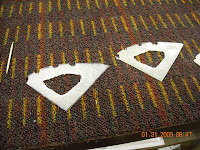 Limber holes were cut into the frames to allow water to pass through. 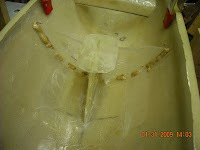 The frames also had the center cut out to minimize weight.